Stop doing such gorgeous manicures and to-die-for nail art. It makes us mere mortals feel impossibly inadequate in the nail art department. 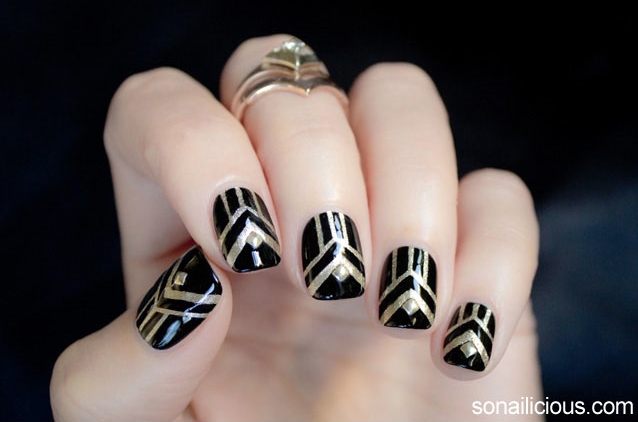 I am especially looking at you Maria and your ah-may-zing Great Gatsby inspired nail tutorial. Seriously girl, you make me want to go out and buy all the nail art tools and nail polish in the world, then I look down at my chubby fingers and dry cuticles and sit back down in shame. I believe on all airlines, including yours, children up to the age of 2 fly for free. Yet how come your on-board bassinets are made so small that they won't fit children older than 8 months? Is it a sly marketing ploy to get us to buy our infants seats even though they're entitled to fly for free? PS: Your customer service in Australia leaves a lot to be desired! Disappointed. Thank you for making your on board bassinets a realistic size so that my 11 month old will fit in it when we fly to France later this year. And your customer service is exemplary. Others (^^^) can learn a lot from you! What's up with the 4:30am wake ups baby? Don't you know mummy needs her beauty sleep? 4:30am is still nighttime baby, so how about we stay in bed for a bit longer ok? I'm not asking for much, all I want is to be able to sleep in till 7am. The pre-baby Lilit would have thought 7am was too early, now 7am is a sleep-in! Ummm... what happened to you since I last wore you? It seems like the majority of my dressy shoes are too big on me now! Have my feet shrank? Is that even possible? Or is it because I wore you when I had swollen pregnancy feet and somehow managed to stretch you? This can only mean one thing - shoe shopping is in order!